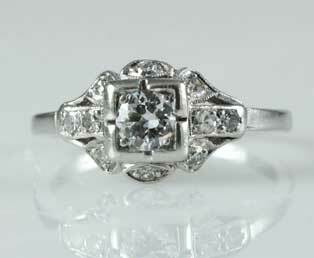 This artful 1930s estate platinum engagement ring will become a symbol of your bond for a lifetime. Glorious rays of light brilliantly disperse from this centered square framed old European-cut diamond. Two rectangular diamond adorned sections extend from the ring middle-point. Feminine diamond topped leaves garnish areas below and above the center diamond. Light open-work designs add to the pretty design. The white diamonds (color F- G) are richly enhanced by the white platinum. Old European-cut diamonds were mostly cut between 1900 to 1920. The name reflects their cut, not country of origin. Though this diamond cut resembles old mine-cut diamonds, they are distinguished by a rounded girdle, more symmetrical shape and additional facets. Enjoy the beauty of this diamond cut under dim light.